If you’ll be in San Antonio next week for the SDA conference, let us know! Ann Maki has been compiling a list of local SDA members attending so we can connect during the conference. Email her at ann@annmaki.com by this Thursday, 5/30 with your email and cell phone and she’ll send you the full list. 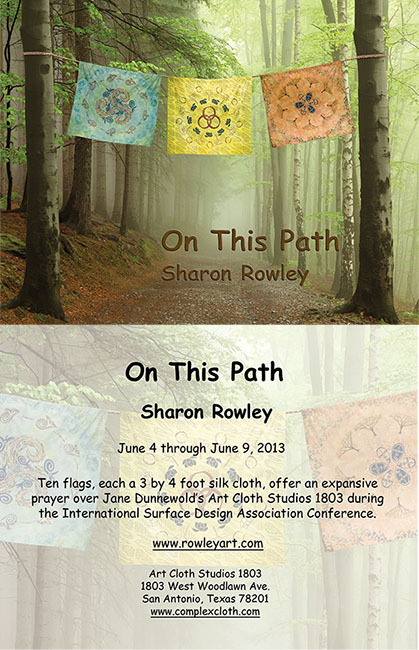 While you in town, check out Sharon Rowley’s exhibit “On This Path” which will hang at Jane Dunnewold’s new Art Cloth Studios during the conference. Ten prayer flags will be hung Tuesday to Sunday. She has arranged a tour of the exhibit and Jane’s studios for SDA-WA members and will send more info to everyone on Ann’s list or you can email her at sharon@rowleyart.com for more information. Whidbey Island Surface Design (WISD) presents its fiber art Show & Sale at WICA’s Zech Hall at 2012 Producers Circle, Langley on Saturday, May 25, 10:00 to 6:00 and Sunday, May 26, 11:00 to 4:00. Also, you can meet the artists at a reception on Friday, May 24, from 5:00 to 7:00. During the show there will be a silent auction for a very special piece of art with the proceeds going to charity. The winner will be announced on Sunday at 3:00. 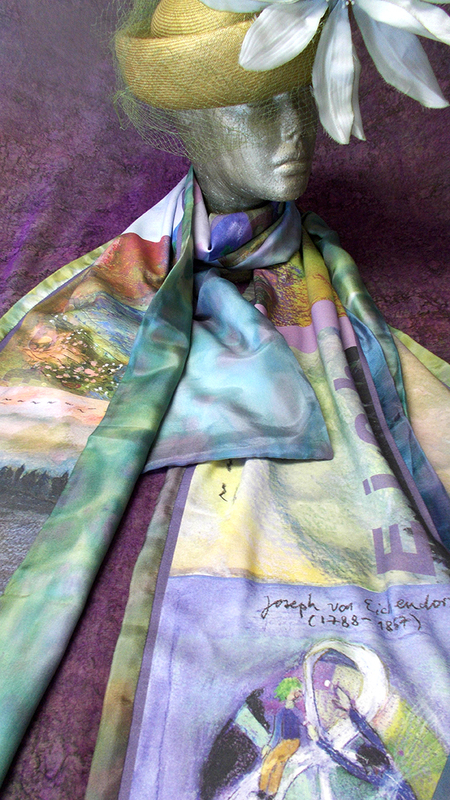 The Show will feature silk scarves and wearable art in hand-dyed glowing colors, contemporary art quilts and mixed media wall pieces, beaded jewelry, handmade textile home décor, and unique gifts. 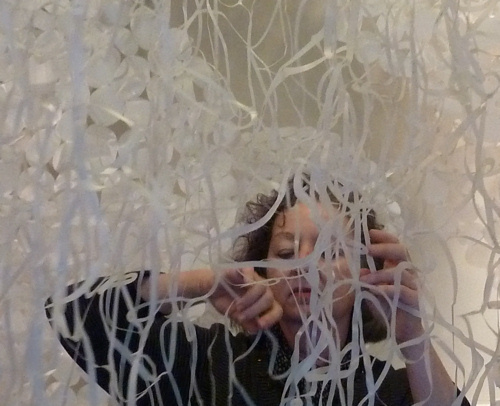 Surface design is the creative exploration of fiber and fabric. The one-of-a-kind artwork blends collage, weaving, felting, beading, basketry, hand-dyed fabric and contemporary quilting in cutting-edge combinations. 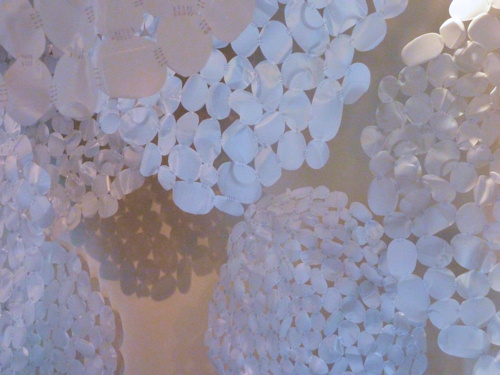 All members of the local art group are also members of the international Surface Design Association. Since its start in 2008, the group has grown to over 32 members, and will continue its show schedule at the Latimer Quilt and Textile Museum, Tillamook, OR (September 2 thru November 3) and at the La Conner Quilt and Textile Museum, La Conner, WA (January thru March 2014). Visit http://whidbeyislandsda.wordpress.com for updates and artist profiles.